Fischer R, Granke O, Chirici G, Meyer P, Seidling W, Stofer S, Corona P, Marchetti M, Travaglini D (2009). Background, main results and conclusions from a test phase for biodiversity assessments on intensive forest monitoring plots in Europe. iForest 2: 67-74. The Forest Biodiversity Test phase Assessments (ForestBIOTA) project was carried out on 97 intensive monitoring plots located in 12 European countries. It aimed at the development and test implementation of monitoring methods for forest biodiversity across Europe. More specifically it covered the fields of (i) stand structure, (ii) forest deadwood, (iii) ground vegetation and (iv) epiphytic lichens. A forest type classification was applied in addition. The project took into account policy requirements stated by a number of political processes and institutions including the Convention on Biological Diversity, the Ministerial Conference for the Protection of Forests in Europe, the Environment for Europe Ministerial Conference and the European Union. Whereas detailed results of the assessments are presented in additional publications (Stofer et al. 2007, in prep, Meyer et al. 2007, submitted), this paper draws a number of general conclusions and gives recommendations for future development of forest biodiversity monitoring in Europe. Manual on methods and criteria for harmonized sampling, assessment, monitoring and analysis of the effects of air pollution on forests (1998-2006). vTI, Hamburg, Germany. Deriving an harmonized scheme of forest types at European continental level. BEAR Technical Report No. 8. European forest types. Categories and types for sustainable forest management and reporting. EEA Technical Report No 9/2006. Die zweite Bundeswaldinventur - BWI2. Das Wichtigste in Kürze. Federal Ministry of Food, Agriculture and Consumer Protection, Berlin, Germany. Allgemeine Verwaltungsvorschrift zur Durchführung der Bundeswaldinventur II (VwV-BWI II) vom 17 Juli 2000. Bundesanzeiger Nummer 146a. Convention on biological diversity concluded at Rio de Janeiro on 5 June 1992. Decision VI/26. Strategic Plan for the Convention on Biological Diversity. Harmonised indicators and estimation procedures for assessing components of biodiversity with NFI data. COST Action E43. Harmonisation of National Forest Inventories in Europe: Techniques for Common Reporting. Working Group 3 report, version 13. Biodiversity trends and threats in Europe. RIVM Report 717101001. UNEP World Conservation Monitoring Centre, Cambridge, UK and Netherlands Environmental Assessment Agency, Bilthoven, NL. Acidification and eutrophication of deciduous forests in northwestern Germany demonstrated by indicator species analysis. Journal of Vegetation Science 8: 855-864. COST action E 43. In: “Progress towards halting the loss of biodiversity by 2010” (EEA 2006). EEA report No 5/2006, Copenhagen, Denmark. Study on European forestry information and communication system. Report on forestry inventory and survey systems (vol. 1-2). European Communities, pp. 1328. Ten common mistakes in designing biodiversity indicators for forest policy. Journal of Environmental Management 68: 121-132. Feasibility study for future contributions in the field of forest biodiversity assessments. Work Report of the Federal Research Centre for Forestry and Forest Products. Hamburg, Germany. The condition of forests in Europe. 2006 Executive Report, vTI, Hamburg, Germany. Bryophytes and lichens as indicators for changes of air pollution in the Serrahn Natural Forest Reserve (Mueritz National Park). Herzogia 17: 279-286. Principles of conservation biology. Sinauer, Sunderland, USA. Indicators for forest biodiversity in Europe: Proposal for terms and definitions. BEAR Technical Report No. 4.
International co-operative programme on assessment and monitoring of air Pollution effects on forests. Minutes of the 18th meeting of the Programme Task Force, Lisbon (Portugal) May 25-29, 2002. Biodiversity evaluation tools for European forests. Ecological Bulletins 50. Forest condition in Europe. 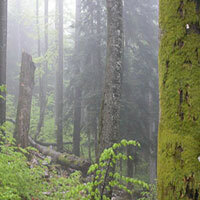 2006 Technical Report of ICP Forests. Arbeitsbericht des Instituts für Weltforstwirtschaft 2006/1. Monitoring and indicators of forest biodiversity in Europe - From ideas to operationality. EFI Proceedings No 51. Improved pan-european indicators for sustainable forest management as adopted by the MCPFE Expert Level Meeting, Vienna (Austria) October 7-8, 2002. Vienna Resolution 4: conserving and enhancing forest biological diversity in Europe (Annex 1). In: Vienna Declaration and Vienna Resolutions adopted at the Fourth Ministerial Conference on the Protection of Forests in Europe, Vienna (Austria) April 28-30, 2003. Ecosystems and human well-being: biodiversity synthesis. World Resources Institute, Washington, DC, USA. Forest ecosystem research in Hainich National Park (Thuringia): First results on flora and vegetation in stands with contrasting tree species diversity. Waldoekologie online 3: 83-99. Waldstrukturen als Steuergrößen für Artengemeinschaften in kollinen bis submontanen Buchenwäldern. Ph.D. Thesis, Fakultät Wissenschaftszentrum Weihenstephan für Ernährung, Landnutzung und Umwelt der Technischen Universität München. Habitat factors for land snails in acid beech forests with a special focus on coarse woody debris. European Journal of Forest Research 124: 233-242. The significance of different indices for stand structure and diversity in forests. Forest Ecology and Management 145: 91-106. Erfassung der Totholzmasse - Zusammenstellung von Verfahrensansätzen und Bewertung ihrer Eignung für massenstatistische Erhebungen. Arbeitsbericht Institut für Waldökologie und Waldinventuren 2007/1, pp. 46. Targets for maintenance of dead wood for biodiversity conservation based on extinction thresholds. Scandinavian Journal of Forest Research 21: 201-208. Pilot study on harmonising National Forest Inventories in Europe. JRC Service Contract, Final Technical Report, pp. 145. Instruktion für die Feldarbeit. Österreichische Waldinventur 2000/2002. Forstliche Bundesversuchsanstalt, Wien, Austria. Forest biodiversity Indicator: dead wood - A proposed approach towards operationalising the MCPFE indicator. In: “Monitoring and Indicators of Forest Biodiversity in Europe - From Ideas to Operationality” (Marchetti M ed). EFI proceedings 51: 49-77. Ground floor vegetation assessment within the intensive (Level II) monitoring of forest ecosystems in Germany: changes and challenges. European Journal of Forest Research 124: 301-312. Deviances from expected Ellenberg indicator values for nitrogen are related to N throughfall deposition in forests. Ecological Indicators 8: 639-646. Forest floor vegetation on ICP Forests monitoring plots in Europe and its relation to atmospheric deposition. International Journal of Environmental Studies 65: 311-322. Veränderung der Immissionsbelastung nordrhein-westfälischer Waldökosystem-Dauerbeobachtungsflächen zwischen 1999 und 2001 ermittelt mit epiphytischen Moosen und Flechten als Bioindikatoren. Limprichtia 20: 179-204. Regional differences in the occurrence of understorey species reflect nitrogen deposition in Swedish forests. Ambio 32: 91-97. Floristic changes in the herb-layer vegetation of a deciduous forest in the Lorraine plain under the influence of atmospheric deposition. Forest Ecology and Management 55: 149-167. We the people. The Millennium Assembly and the Millennium Summit. Declaration by the Environment Ministers of the region of the United Nations Economic Commission for Europe (UNECE). ECE/CEP/94/Rev.1. Report of the World summit on sustainable development. Johannesburg (South Africa) August 26 - September 4, 2002. A/CONF.199/20. Vegetation as a monitor for deposition of nitrogen and acidity. Ph.D. Thesis, University of Utrecht, The Netherlands. Undergrowth as a biomonitor for deposition of nitrogen and acidity in pine forests. Forest Ecology and Management 114: 83-95. Long-term monitoring in the Netherlands suggests that lichens respond to global warming. Lichenologist 34: 141-154. Long distance nitrogen air pollution effects on lichens in Europe. Lichenologist 35: 347-359.